The project consists of a 990-car parking garage with approximately 75,000 square feet of ground-floor retail space. The structure will be located at the 20-acre Hood Park development, behind a 177-unit residential apartment building with 10,500 square feet of ground-floor retail currently under construction at 480 Rutherford Avenue, replacing a surface parking lot. Each parking floor would be 60,000 square feet in size. Lab space could be located on the garage's second floor. Structural framing has started and the concrete core is in place for the upcoming mixed-use project at 100 Hood Park Drive in Charlestown. The new building will house 990 parking spaces along with 75,000 square feet of retail, office, and lab space. 100 Hood Park Drive is part of the 20 acre Hood Park redevelopment, just behind the upcoming luxury apartment building The Harvey, also under construction along Rutherford Avenue. Initial Site work is underway for the upcoming retail/parking garage property in Hood Park in Charlestown. The building will feature parking for 990 cars along with 75,000 square feet of ground-floor retail space. The site, formerly a surface parking lot, is located behind 480 Rutherford Avenue, an upcoming 177 unit rental building under construction. A building permit has been issued for the project at 100 Hood Park Drive in Charlestown. The project consists of a 990-car parking garage with approximately 75,000 square feet of ground-floor retail space. The proposed structure would be located at the 20-acre Hood Park development, behind a 177-unit residential apartment building with 10,500 square feet of ground-floor retail currently under construction at 480 Rutherford Avenue, replacing a surface parking lot. Each parking floor would be 60,000 square feet in size. Lab space could be located on the garage's second floor. New 13-story office and lab building proposed at 10 Stack Street. The new building will consist of 450,000 square feet of office & lab space, including 10,000 square feet of ground-floor retail, and two levels of below-grade parking totaling 150 parking spaces. 10 Stack Street is part of the Hood Park Development in Charlestown, MA. The existing Hood Park is currently occupied by 443,000 square feet of existing structures, including the new campus of Cambridge College, and will ultimately contain nearly 1.2 million square feet of gross floor area and over 1,800 parking spaces. 100 Hood Park Drive will transform an approximately 98,150 square-foot surface parking lot within the twenty acre site known as Hood Park in the Charlestown to a seven-story mixed-use building that will include a five-level parking garage, approximately 40 bicycle storage spaces, and 75,000 square feet of first and second floor restaurant, retail, laboratory office, or other active use space. The development will be transited-oriented, located within an eight-minute walk from MBTA bus and Orange Line subway service. The garage component of the project is designed as a flat plate structure with exterior permeability to comply with open-air ventilation type garage requirements. The floor to floor heights in the garage is approximately thirteen feet, which in combination with the flat plate system will allow for future conversion to office space or other none-parking uses should demand for parking decline sufficiently in the future. The project will include the creation of new sidewalks, street lighting, and landscape, and will employ energy and water efficient features for mechanical, electrical, architectural, and structural systems, assemblies, and materials, where feasible. Sustainable design elements relating to building energy management systems, lighting, recycling, and conservation measures will also be incorporated. The project will also contribute $20,000 to the Parks and Recreation Department to support local open space. Catamount Management Corporation has scrapped plans for a 4,000-seat concert venue that would have been located on the ground floor of an upcoming six-story, 990-car parking garage at the 20-acre Hood Park in Charlestown. Retail space will still be located on the garage’s ground floor, and lab space is now in the works for the garage’s second floor. “We concluded that this proposed entertainment venue was not the right fit for Hood Park at this time” said Chris Kaneb, Manager of Hood Park, at a recent community meeting. Pending city approval, construction of the garage is expected to commence this Summer. Future plans call for a 350,000-square-foot office building next to the garage. 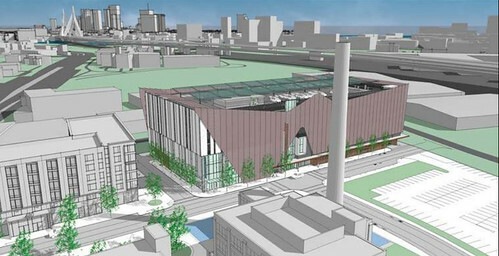 A 4,000-seat concert and entertainment venue would be located on the ground floor of a six-story, 990-car parking garage proposed for the 20-acre Hood Park campus in Charlestown. The venue would operate 150 shows per year, with about 50 to full capacity and 100 with shows at 1,000 to 2,500 seats. Hood Park developer Catamount Management Corporation reportedly has a major venue operator in place, who operates concert and entertainment venues in Boston and other cities. A total of 75,000 square feet on the garage’s ground floor would be comprised of retail, including the venue as well as a restaurant. The garage would be located at 100 Hood Park Drive, behind the upcoming 480 Rutherford Avenue apartment building, and would start construction in July 2018 with completion expected in July 2019. Hood Park developer Catamount Management Corporation has filed plans for the proposed garage with the Boston Planning & Development Agency (BPDA), who is now reviewing the project. Catamount Management Corporation, owner and developer of the 20-acre Hood Park in Charlestown, proposes to revise a previously approved 812-car parking garage to contain 775 parking spaces and approximately 75,000 square feet of ground-floor restaurant and entertainment space. The garage would be located at 100 Hood Park Drive at Hood Park’s southwest corner, along Rutherford Avenue. Hood Park is currently occupied by 443,000 square feet of existing structures, including the new campus of Cambridge College, as well as a 177-unit residential apartment building with 10,500 square feet of ground-floor retail currently under construction at 480 Rutherford Avenue. Catamount has filed a Letter of Intent (LOI) with the Boston Planning & Development Agency (BPDA) formally proposing the 100 Hood Park Drive development, starting the project’s official review process. Additional information about the proposed project will be revealed in the coming months.